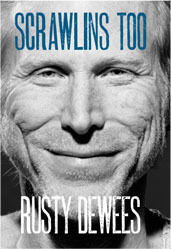 '“Rusty Dewees’ sparse and well told tales masquerade as the mere “scribblings” of a Vermont diarist, but each vignette sparkles with some verity that connects us to our common sense and to our common humanity.” BILL SCHUBART, author ofThe Lamoille Stories and Fat People. Whether you've seen him on film, caught his live stage act, heard him on the radio, or read his weekly newspaper column, there's more to Rusty DeWees than any one medium can reveal. There's more for you, and the uninitiated, to know, and luckily it's now all in one place, your hands! Scrawlins has a little bit of everything for everyone. As many uses as Vermonters find for duct tape, there are facets to Rusty DeWees (and in Scrawlins he reveals one duct-tape creation that's downright blushworthy). Rusty writes in a casual style, like someone you're comfortable standing next to against the wall at a barn dance. But he has a keen eye, a sharp mind, and a big heart matched with a curiosity that makes readers look at family, strangers, and the world around us with a fresh-sometimes humbled, sometimes twinkling-eye. He can be witty and wacky and thoughtful and insightful all at once. He'll have you ponderin, fumin, weepin, and laughin-at times out loud! Scrawlins is entertaining. Whether you're from Vermont, only been there, or been meaning to get there, Rusty DeWees will take you there-with an ear for accent and an eye for the absurd. From the small town of Richford to nearby-as-the-crow- flies Brattleboro to the front porch of Harlan Bishopsiz sausage store, Scrawlins will take you further than you can imagine. RUSTY DEWEES grew up in Stowe, Vermont. He has worked as a paper boy, gas jockey, landscaper, logger, concrete worker, school bus driver, basketball coach, and musician. He spent four years racing stock cars and, for a half-dozen years, he was assistant to the late William J. Doyle of the Doyle New York auction house. He works in radio and TV, and has appeared in more than twenty-five motion pictures. He created and self-produces a one-man comedy show, The Logger, which tours New England and has spawned DVDs, CDs, and calendars. Rusty DeWees lives in Elmore, Vermont.